Let’s not forget though that the one and only reason for having a star as the logo is to reinforce the Star of David and the symbolism of Israel as a state. All that design talk is a load of guff. The Star of David is a LOT more than an influence from a flag... It is a much more powerful symbol than just that. The Eurovision Song Contest's only interest in perhaps utilising a 6-point star symbol for the branding of the 2019 event would nevertheless be because it happens to be on the host country's flag, rather than because of anything to do with Judaism and/or implying any opinion regarding the long-standing Israel/Palestine sensitivities etc. If the UK were ever to host the ESC in the future (which would presumably be after hell freezes over?! ), and if that year's ESC logo was based in any way on the Union Flag, that would not mean that the EBU are suggesting any opinion regarding the Union (e.g. versus Scottish independence etc). You talk about the contest as if it's a person or a single organisation though? The reality is that the contest is the product of the production team making it that year (with some heavy steering from the EBU). This year that production is through KAN - the Israeli Host Broadcaster - and so they will be more than aware of the symbolism over-and-above the flag - as of course will the EBU. The EBU is very aware of sensitivities in this regard I'm sure - with recent issues to do with prospective participants refusing to broadcast the Israeli entry. However the Star of David has much more profound symbolism, and on a wholly different level, to that of the Scottish independence referendum. Particulary in relation to Nazi Germany. I'm not criticising its use as a symbol, nor am I saying it shouldn't be used, but I think it's incredibly naive to think it's just a nod to the national flag. A symbol so loaded with heritage and meaning is never likely to be just that. 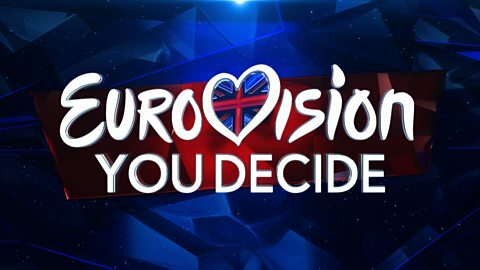 The logo for Eurovision: You Decide has been changed to something more simpler and it has more emphasis on the national colours of red, blue and white there too. We also have a date and details about tickets! You Decide will be live on BBC Two and iPlayer at 7:30pm on Friday 8th February at MediaCityUK in Salford. Here's the link if you guys want to grab a ticket. Good luck! Missed revenue opportunity there which could help fund a better Eurovision campaign. BBC are not allowed to charge for tickets for stuff they produce for television. Someone once told me it was a false economy, selling tickets to TV shows rather than giving them away. The amount made compared to the extra liabilities is apparently negligible. You’re wrong. I’ve paid for tickets for the last three ‘You Decide’ broadcasts. But the last three were staged at external venues - so there was probably some nominal charge to pass on to the venue from the cost of the ticket. This is slightly different in that it's coming from Studio 1 at Dock10 Studios at Media City. A 'proper' tv studio, so there's nothing additional to charge for, everything out the programme budget - and if you are charged for a ticket..
..speak to a member of the senior production team and alert them. Destination Eurovision will be shown on TV5 Monde this year which is widely available in the UK via Virgin and FTA Satellite. TV5 Monde disappeared off channel 717 on Sky in early December. It’s also due to disappear from Virgin at some point if not already so. I believe it remains FTV online.